A captured Japanese photograph of the surrender negotiations between Brevet Lieutenant General Jonathan M. Wainwright IV (August 23, 1883 - September 2, 1953) and Imperial Japanese 14th Area Army Commander Lieutenant General Masaharu Homma (November 27, 1887 - April 3, 1946) on the porch of their meeting house three-quarters of a mile (1.2 kilometers) North of Cabcaben, Bataan, Philippines at around 1715 hours on May 6, 1942. To Wainwright's left are Assistant Chief of Staff Brigadier General Lewis C. Beebe (December 7, 1891 - February 17, 1951) and Wainwright's aide Major Thomas Dooley (December 18, 1913 - March 26, 2006); to his right is Intelligence Director (G2) of I Corps in the Philippines Lieutenant Colonel John R. Pugh (July 27, 1909 - March 2, 1994) and Wainwright's Quartermaster Corps Administrative Assistant Major William Lawrence (March 4, 1894 - May 15, 1942). General Takaji Wachi (February 1, 1893 - October 30, 1978), 14th Army chief of staff, took the seat on Homma's right, Colonel Motoo Nakayama (May 26, 1899 - December 13, 1979), Senior Operations Officer, the one on his left; other officers filled in the spaces beyond. To the rear, between Homma and Nakayama, stood the interpreter. Wainwright, whose nickname was "Skinny Jim" weighted 160 pounds (72 kilograms) and wore a wrinkled uniform with few insignia; he carried a cane. Homma, over six feet (2 meters) and over 200 pounds (90 kilograms) wore his sword and full insignia, with a uniform unbuttoned at the neck. The difference was not lost on the Japanese propagandists. Wainwright's men had destroyed their weapons and American positions, including Malinta Tunnel, were occupied by the Japanese landing troops. Homma demanded Wainwright surrender all of the Philippines, but he had transferred operational control of the Visayan-Mindanao Force under Brigadier General William F. Sharp (September 22, 1885 - March 30, 1947) a few hours earlier to continue resistance. Homma refused to accept Wainwright's surrender unless he ordered Sharp to also surrender, striding out of the discussions at one point. Wainwright had to travel back to Corregidor, where his men were defenseless against the Japanese, and surrender to the local commander. 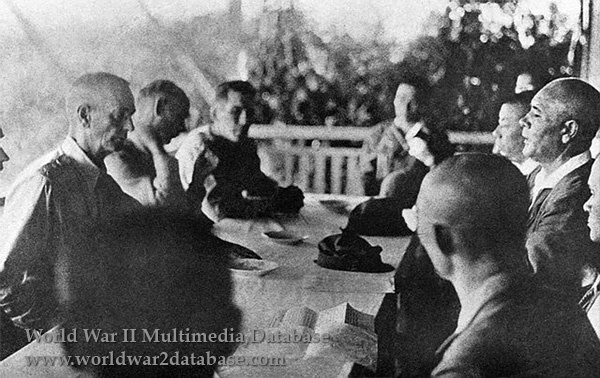 Without any options, Wainwright agreed to order Sharp and all Americans to surrender within four days when he saw his men held hostage on Corregidor. Homma was disgraced over his slow progress in his conquest of the Philippines, and he was even reported to have committed suicide on March 10, 1942. That report was obviously erroneous, but his superiors derided his desire to minimize casualties among the 14th Army and his attempt to outmaneuver the Filipino-American forces instead of mounting costly frontal assaults. Still, he was able to starve out the Bataan defenders in April 1942 and surround and bombard Corregidor in April-May 1942. The subsequent costly Japanese landings on Corregidor on May 6 forced Wainwright to surrender.